Youth was the musical 'must have' in 2007. Could marriage be the musical 'must have' in 2008? My favourite Christmas disc this year was Ton Koopman playing Christmas Carols on the baroque Van Peteghem organ in St. Martinuskerk, Haringe, Belgium. Wonderful music from Sweelink, Buxtehude, Bull and Bach, wonderful playing by Koopman on the 1778 organ, with wonderful sound from producer Tini Mathot, who just happens to be Mrs Koopman, and the CD really is a family affair as it is released on Koopman's own Antoine Marchand record label. Tini Mathot is a distinguished keyboard player in her own right, and she is seen above playing alongside her husband. 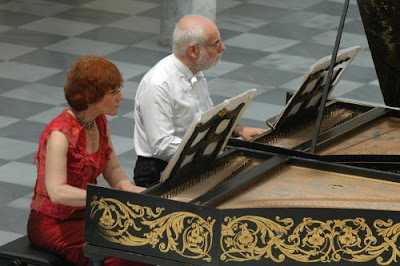 I last heard them together several years ago playing the Art of Fugue on two harpsichords ago in the peerless acoustics of St George's Brandon Hill, Bristol. Tini Mathot and Ton Koopman are the latest in a distinguished line of couples who have worked together as performers and producers. 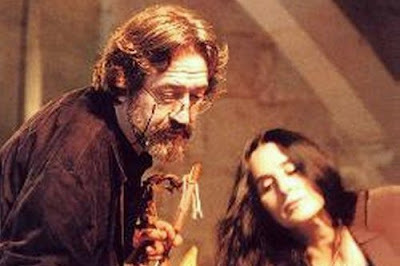 There are Isabella de Sabata and John Eliot Gardiner at Soli deo Gloria, and Montserrat Figueras and Jordi Savall at Alia Vox (photo below), like Mathot and Koopman both couples work in the early music field, what is it about gut strings? They were preceeded by Joan Sutherland and Richard Bonynge, and of course Elisabeth Schwarzkopf and Walter Legge. Reminders of other husband and wife performer and production teams please. And yes, I know about Joyce Hatto and William Barrington-Coupe, while Carla Bruni and Nicolas Sarkozy don't count, even if the bling-bling President's son is a hip hop producer. Judging by the number of mentions in recent weeks Belgium is the 'must have' country for 2008. Check out these links, and we are off there next month for John Cage, Morton Feldman et al. Well, 'literally', there is the Placido and Marta Domingo opera team. Ton Koopman is such an amazing musician, and an incredibly nice man. I once had dinner with him at an Indian restuarant in Toronto. As for musicial couples, albeit not as producer/musician team, don't forget Pierette Alarie and Leopold Simoneau. How about Producer Peter Gelb and conductor Keri-Lynn Wilson? Naxos - producer/guitarist Norbert Kraft and producer/harpsichordist Bonnie Silver.